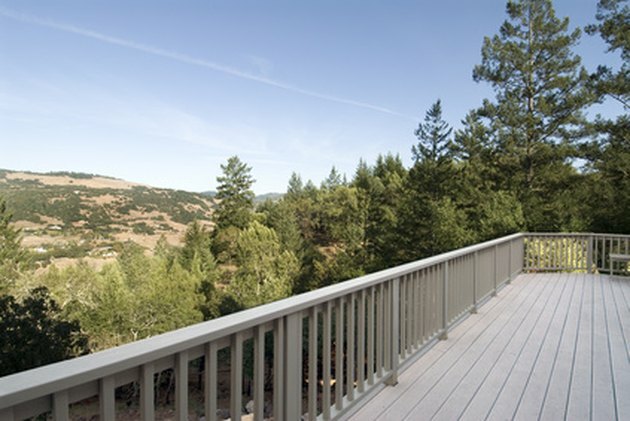 Determining the spacing of posts is the first step in installing a railing on your deck or porch. Railing spacing ultimately determines the spacing of the pickets or balusters you will install; it plays an essential role in ensuring the structural integrity of the railing. Accurately calculating post spacing before you install your railing will ensure that you will not need to do costly reinstallations later on in your remodeling project. Properly spacing your posts plays an essential role in installing a strong and aesthetically pleasing railing. Measure the distance between the corner posts of your deck with a measuring tape. If you plan to install railings on multiple sides of the deck, measure the length of each section you wish to rail. Divide the length of your railing to create sections of equal lengths between five and seven feet; the thicker your railing posts, the longer you can make the subsections. If your deck does not have an easily divisible length, use an online spacing calculator (see the link in the Resources section for an example). Such calculators allow you to calculate the spacing of your posts using the width of the posts, the length of the area to rail and the size of the balustrades. Mark the placement of the posts on the deck. Center a post on each of these marks, and mark the deck on each side of the post. Drill two 1/4inch holes through the base of each of your posts using a drill, then attach the posts to the deck with bolts or screws using a screwdriver.